Our main stream media spin a few days ago singing all sorts of praise to Temasek Holdings as below, from AsiaOne. Its group net profit rose to S$13 billion from S$5 billion in the previous year, the investment firm said in its annual report, the Temasek Review 2011, which was released yesterday. The net value of Temasek's investment portfolio also hit a record high of S$193 billion, up from S$186 billion the previous year. Portfolio value increases due to CPF raiding? I shall focus my analysis on portfolio value, as it is the most important indication of fund performance. The increase of our portfolio value was exalted but what is not known is, whether that increase is due to raiding of our CPF. Temasek perpetually denied it has anything to do with CPF, which I am skeptical. I believe, CPF was raided by government first. It was repackage into certain asset classes which are then handover to Temasek and GIC. In this way, Temasek has robbed CPF through government without dealing directly with CPF. That is the reason of denial of Temasek with regard to CPF. Nevertheless, there is reason to believe that GIC instead is the preferred vehicle for handling CPF monies and the majority of CPF savings are channelled to GIC. Next, if the portfolio is priced in gold, it actually see a decrease compared to 2010. 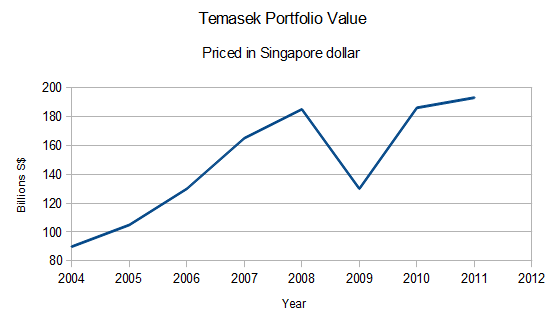 In 2010 Temasek portfolio is equivalent to 3200 tonnes of gold while this year, it has dropped to 2900 tonnes. 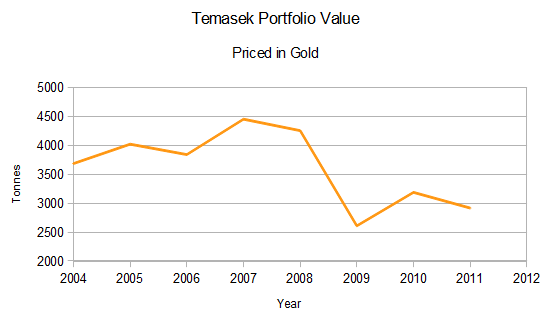 And Temasek has not recovered its portfolio peak of 4500 tonnes of gold equivalent in 2007. The increase in portfolio value is nothing more than a symptom of Sing dollar debasement, or more sinisterly, CPF plundering.